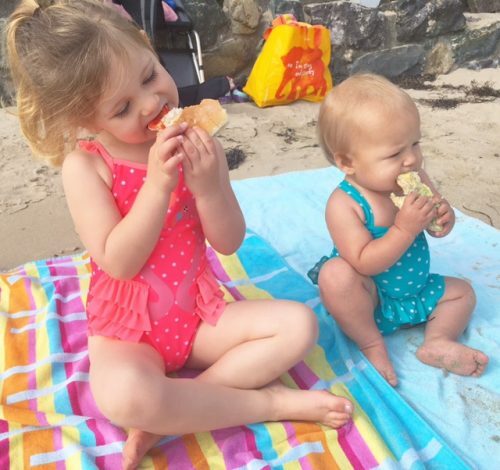 With my first daughter, we embraced every aspect of baby led weaning, I didn’t find the experience intimidating or overwhelming, and loved being creative in the kitchen so that my little lady Frankie could have an exciting, delicious, sensory experience with every meal time. Frankie was a big girl, very independent and just always seemed a little older than she really was. 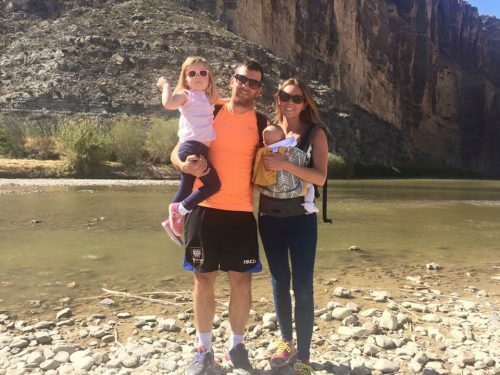 She typically sat at the 91st percentile for her height and weight and just felt ‘solid’. Nothing was off the cards with Frankie, her tolerance for spicy food is still very impressive! 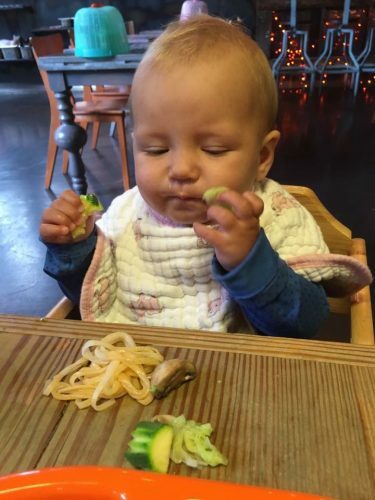 My littlest Noa, however felt so much smaller and just didn’t seems ‘big’ enough to do baby led weaning. (She didn’t sit up until after 7 months). We did eventually start baby led weaning but not until Noa was almost 8 months. We have done a real mix of both purée and BLW with Noa, she just isn’t the same child as Frankie and I definitely feel less confident at times giving her certain foods. I think it’s so important to remember that every child is different and as a mom/mum you should always follow your gut instinct. When we moved to Texas Frankie was just 2. I remember giving her a quick snack called Teddy Graham’s, and within 40 minutes she was hyper. She was obviously very sensitive to the different ingredients in the food in the USA. My husband and I also started to struggle and found our usual meals where making us feel quite unwell and upsetting our usual rhythm. I started to do some research and look at the foods in comparison to the UK, and I was astounded. Many ingredients used in everyday items in the US were banned in the UK. No wonder Frankie had been so sensitive to the foods I was giving her! Making this discovery felt terrifying. What on earth was I going to feed my family?? Even the meat scared me ‘no added hormones or antibiotics in our meat’ some packaging would say. My goodness what effect could/are these foods having on people’s bodies?? My husband and I had a serious talk and started to research healthier ways to eat in the US. After a lot of research and some serious conversations, we decided that from January 2016 we would become a plant based family. Our food shop miraculously became a lot cheaper and yet the foods we were eating were so much tastier and good whole foods. Initially we decided to do just a 6 week trial to see if we were able to get enough of what we all needed in our diet. I bought the Deliciously Ella cook book and the rest really is history. 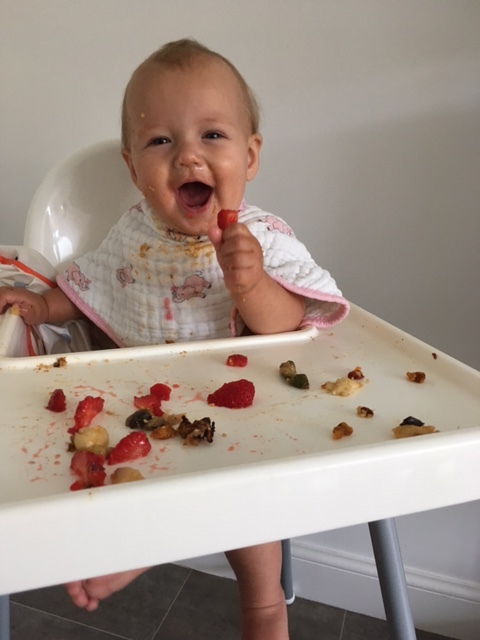 Frankie enjoyed the food she was eating, I noticed a huge difference in her behaviour and it felt good to know we were eating a good whole food diet. People often wonder how we ensure our children are getting adequate calcium when they don’t eat dairy. Firstly, cows milk is actually quite acidic so isn’t absorbed well by the body, meaning it can actually cause a calcium deficit. I cook with leafy veg such as kale, spinach, broccoli at every dinner time, whether the veg are served up alongside a meal or cooked within a curry or casserole. Spinach isn’t the best source of calcium as it isn’t absorbed well by the body, but the girls enjoy eating it and in all fairness, actually love all vegetables. I also add rocket to the girls sandwiches at lunch time, they love this and avian it’s a fantastic source of calcium. Something we are weary off is plant based milks. We make sure that we buy plant milk that is fortified, this is something that you must check. You want to see that there is 300mg of calcium to every 250ml serving. There are so many great varieties of plant milks these days, all offering something a little different. For example oat milk is a great source of fibre, soy milk offered approximately 8-10g of protein for every cup drank and almond milk contains a substantial amount of vitamin E. We typically tend to go for the fortified brand that is on offer, and it also gives us a bit of variety/encouraged us to try new milks. Alpro have some great dairy alternatives that are fortified too, and their new ‘go on yoghurts’ are divine! The children snack on nuts throughout the day, Frankie especially loves cashew nuts and almonds! We also try to include beans or lentils with one meal a day. And the girls are huge fans of hummus and chickpeas! My 11 month old Noa drinks a mix of breast milk and wysoy formula when I’m not around. So as you can see there are so many ways to consume calcium without needing dairy. One thing that does worry me and I hold my hands up is B12. B12 helps the body to produce red blood cells and helps the brain and nervous system to function. B12 is given to cattle, so most people get their dosage through eating meat. Luckily for us through many products such as plant milks and cereals are now fortified with it. I always worry about how much B12 the children get so have now introduced a multivitamin which includes the correct dosage for a days worth of B12. 9 months on and we are still eating a plant based diet and are now living back in the UK. 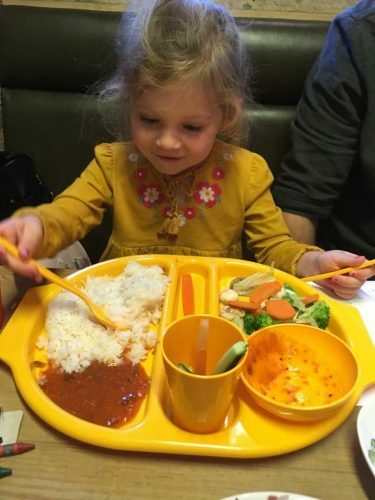 We do on occasion have some chocolate or if we eat out we will go for the vegetarian option, but then its all about balance isn’t it and making it work for your family?! Here is one of my favourite, super quick recipes that the children love! Chop onion and put it on a low heat in a casserole dish with a teaspoon of coconut oil, add the ginger, curry powder and any veg you can find. After a few minutes through in the coconut milk and the chopped tomatoes and let it simmer. Add in the sweet potato once it has finished in the microwave (I like to chop mine into large chunks that are easy for my littlie to hold). Add your handful of spinach (optional). Measure out a cup of quinoa and pop it into the dish with the other ingredients. Leave it to simmer on a medium to low heat for about 25-30 minutes. Serve with rice, or we occasionally like to enjoy ours with pitta breads and hummus. Thanks for reading! Have you ever considered a plant based diet? Do you ever get scared and worry about what ingredients are in foods?